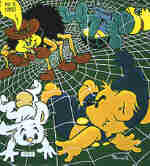 Bamse and his friends don’t want to be eaten by the spider. Even animals use chemical signals or toxins as a defence against predators, animals of prey. One example is the poison dart frogs of South America which contain potent poisons and therefore shine in bright colours that warn of danger. The frogs use the poison as a defence, the Indians use it as a poison for their hunting arrows and now it has been found that certain of the frog’s toxins are much more potent pain-killers than morphine. Milder poisons are also present in the skin of the common toad (Bufo bufo). These toxins are various cardio-active glycosides and similar to those in foxglove and lily of the valley, still to be found in our pharmacies. Thus witches’ use of toad skins was not so stupid after all. There are also caterpillars, fish, beetles, and even birds that take up plant toxins through their food. This is then stored in their bodies and discourages other animals from eating them. In fact, the poison found in the poison dart frogs is not produced by the frogs themselves, but comes from their diet. Similar toxic substances have been found in insects and centipedes that the frogs eat.